Plastic is recognised as the most suitable material to use in constructing chemical exhaust fans to handle the most demanding environments with corrosive fumes and volatile gases. Chemco chemical exhaust fans are manufactured from polypropylene (PP) or glass reinforced plastic (GRP) and thus have superior anti-corrosion and chemical resistance qualities. They are robust in construction and guaranteed to provide many years of trouble-free, energy efficient and economical performance. Chemco chemical exhaust fans conform to global standards, have an open and flexible drive platform and are simple to configure and operate. Viking Plastics supplies sizes ranging from a small 0.05kW (100m³/h) fan right up to an impressive 7.5kW, 1000mm diameter unit with a volume flow rate over 10,000m³/h. 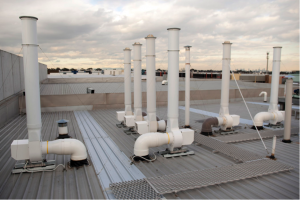 Chemical fume exhaust fan with exhaust ducting located on a rooftop. Casing is constructed from anti-corrosive and chemical resistant thermoplastic such as polypropylene or glass reinforced plastic (Chem 400 model) to withstand the corrosive action of almost all chemicals. True volute form casing and high efficiency inlet cone provide an even distribution of air for increased aerodynamic performance, quieter operation and lower running costs. Available with either single phase (230V) or three phase (415V) motors.